Some of us get the majority of our nutrients by cooking with nutrient-dense foods, while others get that food value through snacking. Whether you’re a feaster or a grazer, there are plenty of fun ways to get these three nuts into your diet. 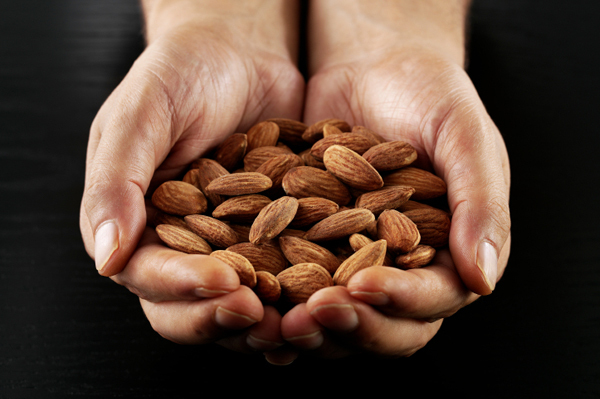 Just one serving of almonds — that’s a quarter of a cup — has more than 4 grams of fibre and over 7 grams of protein. Because fibre helps regulate your digestive system and protein lets your muscles work more efficiently, almonds are the perfect way to start your day right. Rather than boring old peanut butter, for breakfast or as a quick snack, give almond butter a try. It’s loaded with vitamin E and magnesium and tastes great! Spread it on a piece of whole-wheat bread in the morning, or pair it with celery sticks and/or apple slices for a quick, light snack. Almond milk is particularly great for cooking as it is lactose-free and can easily be substituted into any recipe that requires milk or cream. Sliced almonds are great for adding an extra crunch to green salads or as a flavourful addition baked into muffins. For an easy way to get almonds into your meals, start your day off right with Dr. Oz’s 30/30 Smoothie. Just a quarter-cup of walnuts will provide you with 90 per cent of your daily omega-3 fatty acid requirements, which helps guard against inflammation and reduces blood plessure and plaque build-up. Walnuts are also high in many vitamins and minerals, such as iron, copper and zinc, which protect the body and assist with proper cell function. Toasted walnuts are great for sprinkling on just about everything. If possible, buy your walnuts whole and in the shell, as they will retain the most flavour that way. To toast them, begin by preheating your oven to 400 degrees Fahrenheit. Shell the walnuts and chop into pieces around the size of a pea. Place on a pan and toast them in the oven for about 8 minutes. Check on them frequently, as there is a fine line between toasty-good and overdone. Keep them on hand for a quick grab-and-go snack or to sprinkle on yogurt, salad and oatmeal. Walnuts add just the right amout of crunch and flavour to baked goods. For a healthy start to your morning, try out Taste.com’s carrot and walnut muffins. Or, if you aren’t much of a sweets person, consider using blended walnuts to thicken soup and sauces. You’ll get a rich, nutty flavour and all the health benefits, without even noticing. Cashews are rich in magnesium, which is a key component of healthy bones, and copper, which supports your body’s defence mechanisms. Pay a visit to your local bulk food store and fill some bags up with all your favourite dried fruits, nuts and seeds — including, of course, cashews! When you get home, toss everything into a large container and combine well. Keep some small snack bags next to it and, whenever you’re on your way out the door and know you’ll be needing a snack later on, just bag up a handful and go. Many cultures incorporate cashews into their regional dishes because they are loaded with flavour and provide a soft yet delicious crunch. They go well with virtually all meat, veggies and sauces, so they’re perfect for a whole host of dishes. To get started cooking with these tasty nuts, whip up The Heart and Stroke Foundation’s broccoli cashew stir-fry for a delicious dinner. For more information on these and other delicious options, Canadian Living offers up everything you need to know about nuts.